During the festive holiday season, we are all indulged with sales and promotions. So it is just the perfect timing to refresh ourselves with some coffee with Starbucks for the last week of the new year countdown, from 23rd or 24th to 31 December 2012. Opening Promo. Free coffee on 23rd 10am-12pm; Buy 1 Free 1 until 31st Dec (12pm-2pm). 1st 24hour launching. 50% only for Facebook fans Starbucks facebook. - Share this photo on your wall. - Present this at Starbucks Bukit Bintang and get 50% off for your favourite handcrafted beverage. Opening Promo. 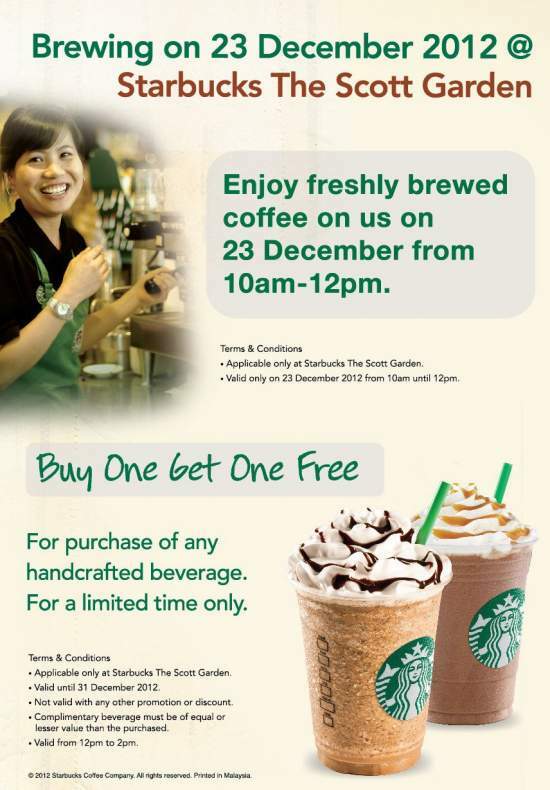 Free coffee on opening day and Buy 1 Free 1 4 - 15th Dec 2012, 12pm-2pm. It is one of the most happening places in town now. Look at the bee line of cars on weekends and public holidays, they are just like the shopping phenomenal in KL! This entry was posted on Wednesday, December 26th, 2012 at 3:49 pm	and is filed under Cafes, Food Promo. You can follow any responses to this entry through the RSS 2.0 feed. You can leave a response, or trackback from your own site.